Hi all!!! Happy Easter!!!! I hope it's going well for you!!!. We had a big Easter lunch here at the Beach House yesterday and this was the artwork I came up with to go on the back deck. This one is ex local yacht club and Mr Beach House 'thought I might like it'. 'Like it' you darling man..... Paint splattered, aged wood, falling apart.....I love it. It was braced with a revolting old bit of nylon rope though, which had to go. We had another tussle over that one. Can you imagine 6 kiddos running around here on Easter Sunday, baskets in hand, chasing down the eggs and the whole thing crashing to the ground, as they jostled around the garden???? Well that's what my over caring husband was worried about. 'No problem' I said......I'm not going to let a potential trip to the hospital with a child, cut and bruised by a falling ladder, ruin my artistic creativity. 'Let's cut off the rope and brace it with driftwood' I retorted to his ever so practical solution to any problem we ever have. I don't know about you, but I'm in the 'as long as it looks good' camp.... And so it was. 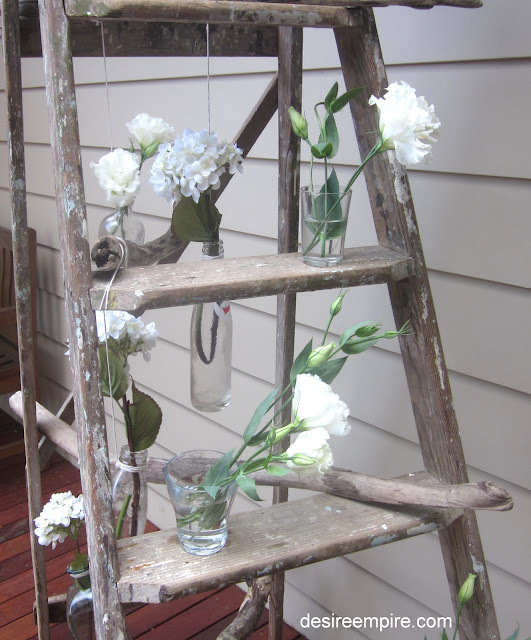 The ladder was braced with driftwood and strung with vintage bottles and white flowers. I am happy to report all six children survived unscathed, if a little chocolaty around the chops. I'd play you the video of the hunt, but my voice over lay, is just too appalling and I'd rather keep the illusion going if you don't mind. Now everyone could relax and relax we did!!!! Sitting around a table, eating good food with people I really like, kiddos happily playing in the background, is about the best thing in life for me. We had a great day out on the deck. Oh and if you like it here, think about following me. You can follow on GFC, Face Book, Twitter, Linky followers or by email. All the options are in my sidebar. Very pretty, Carolyn! I was out thrifting yesterday, and came across two vintage wood step ladders. I stopped myself from buying both, as I don't know where I'd put them. It sounds like you had an enjoyable Easter! Oh I love this! What a cute and clever idea. Love the bottles hanging from the ladder and the addition of white flowers is just perfect! Yummy looking dinner! And your ladder is so whimsical. 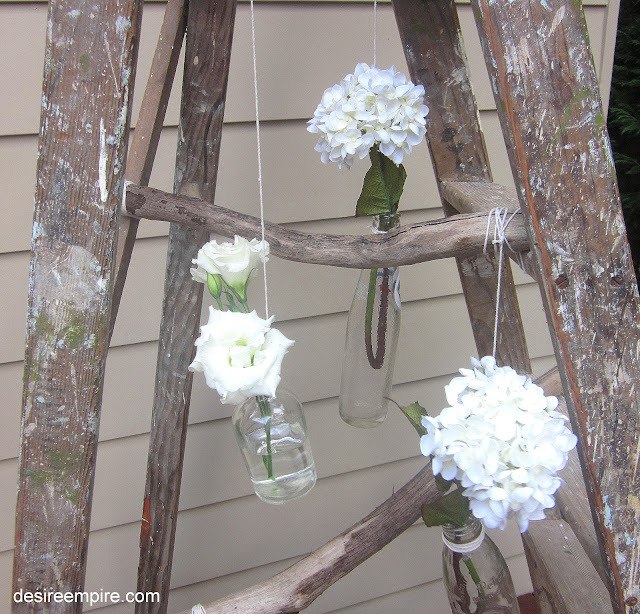 Love the hanging bottles with flowers. the ladder was a great find! love it with the bottles, driftwood & flowers. Oooh I LOVE that!!! What a great idea! I need to try something like this on my deck. Super cute! I've had my eye out for some old wood ladders lately, but I've had no luck. I love this look. That is so COOL! The weathered wood with the white flowers, gorgeous. Wonderful ladder! 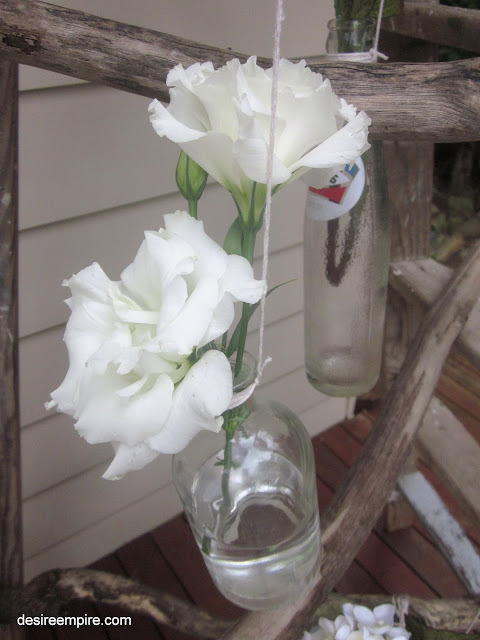 The bottles are so fun hanging from it. Nice to visit with you. 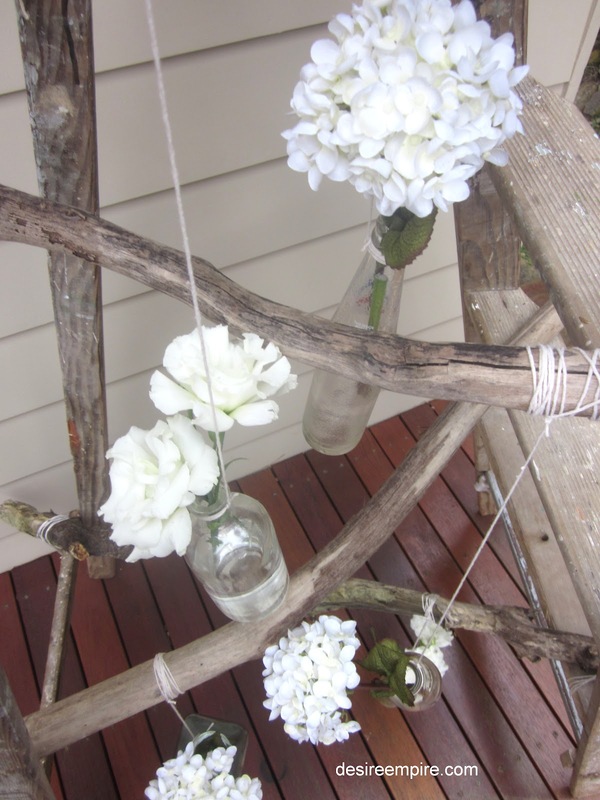 What a great idea...the drift wood pieces are the best! looks like a work of art. darling. am inviting you /your creative ideas over to our party at http://www.finecraftguild.com/party/ our readers would love to find this! hope see you on our blog! 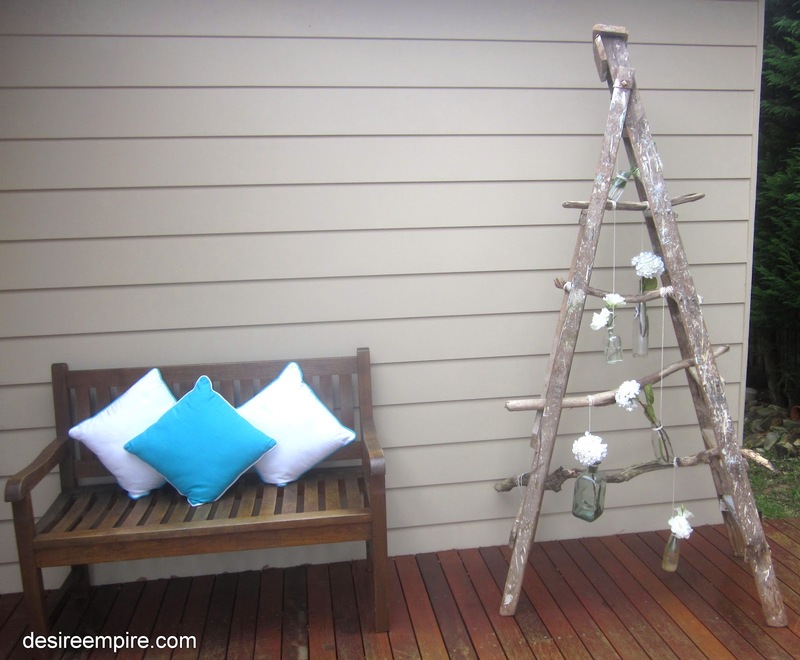 Love that ladder--looks so great the way you displayed it! Glad to hear that you had such a wonderful Easter. Your table and decorations looked fabulous! I like your ladder, so cute! Looks like a good time was in progress...I swear that guy in the blue shirt looks just like my brother! 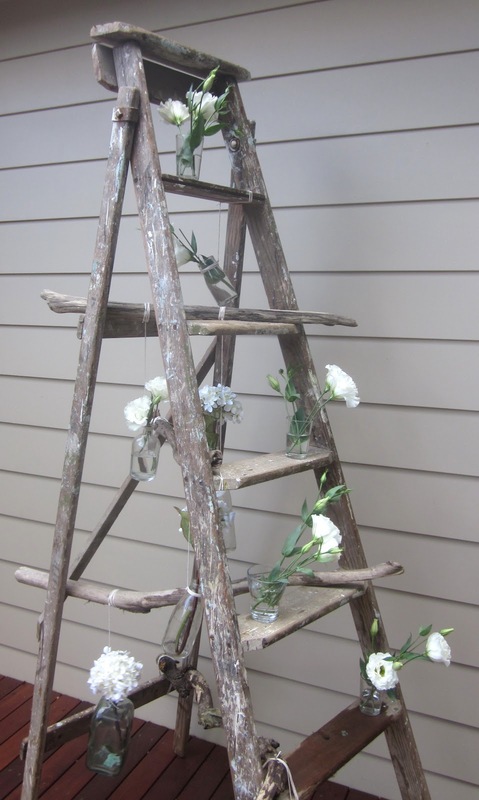 Your ladders are AWESOME! What an amazing idea! Pretty. I have a ton of vintage bottles and I am always looking for something to do with them. Great idea! Thank you!